Guttering – Why it pays to look after it. There is a good chance that the guttering in your property isn’t always something that you instantly think about. However, it may come as a surprise to learn that your guttering is something that you should really make an effort to take care of.This is particularly true during the autumn and winter months when debris and items can build up, leading to a blockage. So why is guttering Birmingham important to your home and what can you do to take care of it? Why good quality guttering is key – Your guttering has an important job to do when it comes to your property. It is there to collect water from that runs down the roof and make sure that it is properly diverted away from the foundations of the building. This process means that the exterior and interior of your property is not at risk of water damage as the water seeps into the plaster and brickwork. Guttering comes in a variety of different forms, however no matter the type of guttering the care for it is much the same. The most common form of guttering that you will see outside properties in the UK is PVC. However, you may also see aluminium and stainless steel gutters too. PVC is the most common because not only is it hard wearing and durable. But it is also easy to replace, and affordable too. When choosing guttering for your home you will need to consider the size and make sure that the guttering is going to be up to the job. It may sound tricky to make sure that your guttering is properly looked after, but it is actually relatively easy to do. During the autumn and winter months you should aim to clean out your guttering each and every week. Particularly if you live in an area that has plenty of trees. Whilst greenery looks lovely, it means that leaves, moss and twigs are much more likely to build up in your gutters, potentially blocking them. Properties in urban areas do not escape, as they could see litter and other types of debris finding its way into their gutters. Some properties may find that once a week is needed, whilst others could get by with once a month, however, the important thing is that you take a look at your guttering and see just how blocked it is. Blocked guttering means a blocked water flow, and this could break the guttering, cause a leak or perhaps mean that water overflows onto your roof or walls. 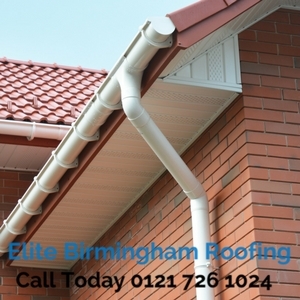 If you are not sure that you are going to be able to maintain your gutters yourself, then it might be advisable to request a roofing expert like Elite Birmingham Roofing to do the work for you. Not only will they know what to look out for. But they will also have the right tools and equipment to hand to make sure that the gutter is clear, and so is the water flow.